Rostov-on-Don has long served as one of the most vital industrial centres and transport hubs of the Russian South. The city boasts a rich architectural legacy in keeping with this status, including numerous examples of the Imperial, Russian Revivalist, Eclectic, Modernist, and Neoclassical styles. 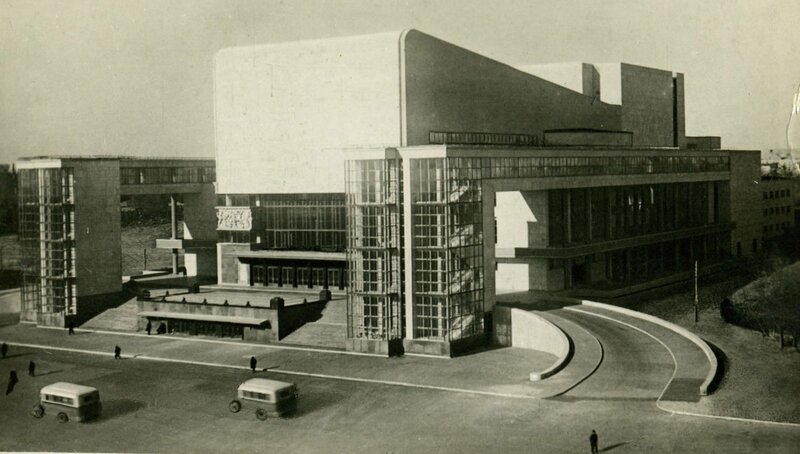 Most engaging of all are the city’s Constructivist monuments, among which the Maxim Gorky Drama Theatre stands out as a key symbol of both the movement and the city which gave birth to it. The theatre, designed around the form of a Soviet tractor, is a powerful manifestation of the 20th-century avant-garde, and is widely considered one of the greatest masterpieces of the Constructivist style, hailed as the jewel in the crown of Soviet architecture by Le Corbusier and Oscar Niemeyer. The legendary Theatre is not, however, the only masterpiece of the avant-garde in Rostov-on-Don to survive into the 21st century. Yet the city’s Constructivist legacy is often overlooked today, particularly by outsiders who are more familiar with the avant-garde landmarks of Moscow or Yekaterinburg. What were the origins of this legacy and why has it been forgotten? And what threats, past and present, to Rostov-on-Don’s Constructivist heritage? The very first Constructivist buildings emerged in the aftermath of the Civil War, almost exclusively in Moscow and St Petersburg. 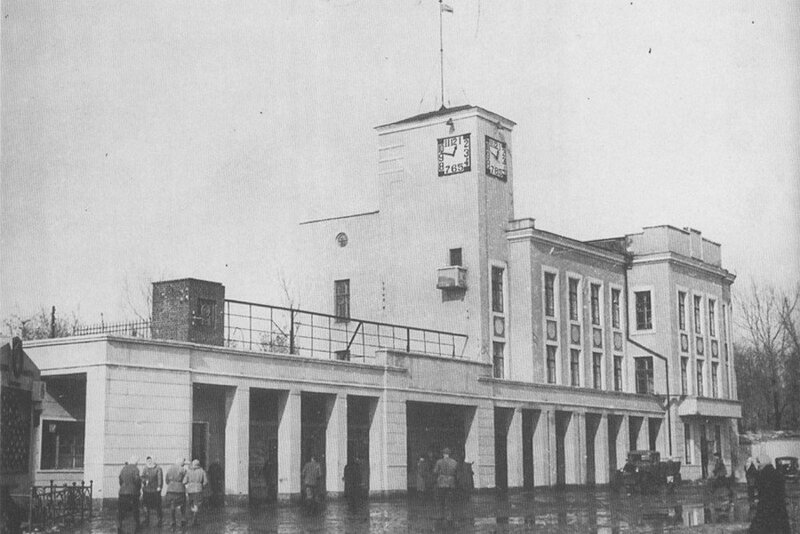 In Rostov-on-Don, as with almost all provincial Russian cities, the first Constructivist projects appeared only later, in 1927 and continuing into the early 1930s. As a major industrial centre on the Don River, and the capital of a region experiencing rapid economic growth, Rostov presented fertile ground for the spread of Constructivism from the old capitals to the provinces. Constructivism was concerned primarily with functionality. Form was supposed to follow function; the aesthetic was not only secondary to utilitarian concerns, but derived from it. 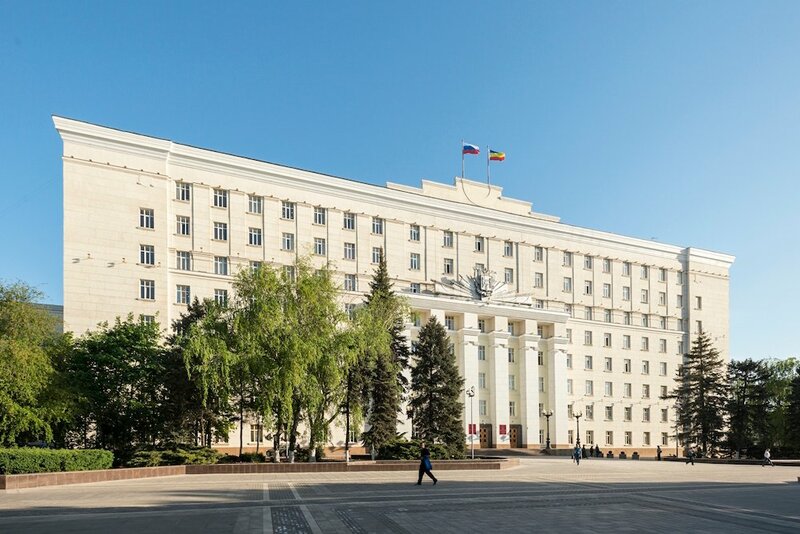 The principle was applied to many buildings in Rostov-on-Don, including factories, industrial buildings, canteens, residential buildings, workers’ clubs, assembly halls and cultural centres. Although many of these projects were conceived or overseen by architects from the capital, it is important to note that the new style was not imposed on the city by Moscow. Rostov-on-Don had produced a considerable number of talented architects in the period immediately before the revolution, and in the years that followed many of these architects not only succeeded at mastering the new forms and ideas of Constructivism, but became enthusiastic and influential advocates of the movement. It was a combination of homegrown and metropolitan architects that worked on Rostselmash, a huge factory for the production of combine harvesters which was to be one of the largest construction projects of the first Five-Year Plan (1928-32). Rostselmash is one of the few large-scale enterprises of the Stalinist years that survived the collapse of the Soviet Union to become a successful company with global reach. Work on the factory began in 1931, in parallel with the construction of a factory village of almost 100 additional buildings, and continued for seven years. The scale of the project was monumental: the construction site was comparable in size to the area occupied by the entire of Rostov-on-Don before the revolution. The building which housed the factory was executed in accordance with the aesthetics of industrial architecture and is a classic example of the fusion of function and form. During the war the building was destroyed, and while the management offices were rebuilt in an entirely different style, the entrance to the workers’ quarters was restored according to the original Constructivist plans. The workers’ facilities adjoining the factory (known previously as the Selmashstroy Village) consisted not only of residential buildings but also of social facilities, including numerous schools, canteens, health and maternity clinics, bathhouses and a hall of culture. They have been almost entirely preserved in their original form; only the hall of culture was destroyed during the Second World War. Another significant construction project of the 1930s was the House of Soviets, one of the most brilliant examples of Constructivism in Rostov-on-Don, and also the largest government building in the south of Russia. Designed by the celebrated architect Ilya Golosov, the House of Soviets is situated in the very centre of the city and takes up almost an entire block. The construction of this immense project took significantly longer than expected; the House of Soviets was still unfinished, ten years after construction had begun, when the Germans invaded Russia in 1941. The original designs included a 12-story cylindrical conference hall built of glass that was supposed to stand on the site today occupied by a public square. It was this edifice, not the eight-story building behind it, that was supposed to be the focal point of the entire complex, but with the outbreak of war the project was frozen. When work finally began again in the 1950s, now under a new architect, priority was given to restoring the existing buildings, which had suffered considerably during the war. Completion of the main façade was not achieved until 1968. 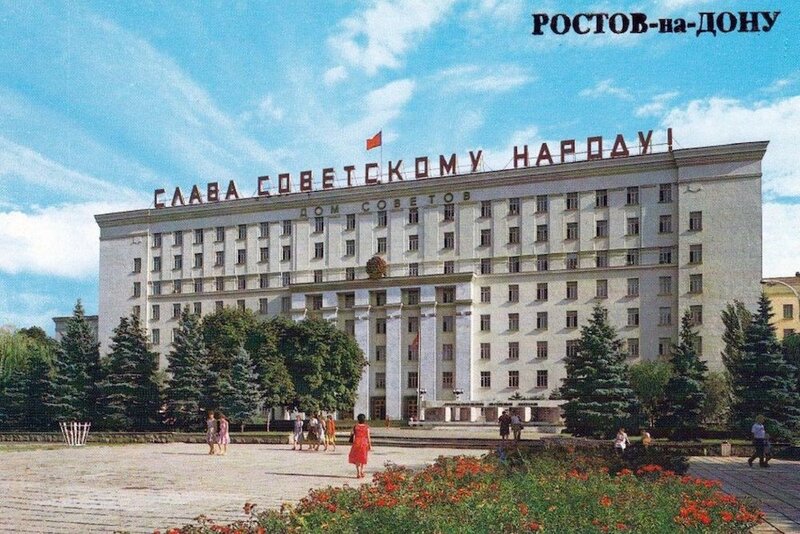 By that time the appearance of the building had changed to reflect the modernism in favour during the Khrushchev years. Nevertheless, the original Constructivist elements in the design are clearly visible. The foremost symbol of Constructivism in Rostov-on-Don, and the city’s most widely recognised landmark, is the Gorky Drama Theatre. The theatre was designed by two famous Soviet architects, Vladimir Schuko and Vladimir Gelfreykh and finished in 1935 on an empty site between Rostov-on-Don and Nakhichevan-on-Don, a town built by Armenian settlers on the orders of Catherine II and later absorbed into Rostov itself. Schuko and Gelfreykh were already well-known architects by 1935, whose notable achievements included the national Lenin Library in Moscow. The Gorky Drama Theatre was an equally bold and brilliant project. The central structure of the building is set back, flanked on either side by two giant and glass-fronted arms. Entrance to the theatre is through the façade of the central structure, where visitors begin in the vast foyer of the main stage. The façade is fronted with white Italian marble, while the other surfaces of the building use glass, granite and Crimean limestone. The theatre is adorned with high reliefs sculpted by Sergey Korolkov (known in Russia as the “Rodin of the Don”) depicting scenes from the Russian Civil War. The auditorium seated more than 2,000 spectators. The interiors were suitably grand, including marble columns and staircases, elegant furniture and auditorium boxes carved from white walnut. The first plays were staged by famous directors from Moscow. The theatre in effect joined the two once-separate cities of Rostov-on-Don and Nakhichevan-on-Don together. A square and park was adjoined to the theatre, and the position of the theatre and its adjoining public space created a new axis for the enlarged city, facing (as with the façade of the theatre) the Don River. The people of Rostov-on-Don immediately christened the theatre “the tractor”. A quotation from a newspaper of the time is typical: “The theatre is formed like a vast stone tractor, with tracks made of glass and a radiator made of blinding white marble. Granite and glass are combined in this unusual building in a surprisingly bold and counterintuitive fashion: the heavy stone body soars boldly into the air, while the light glass galleries to its side are calm, sober and still. 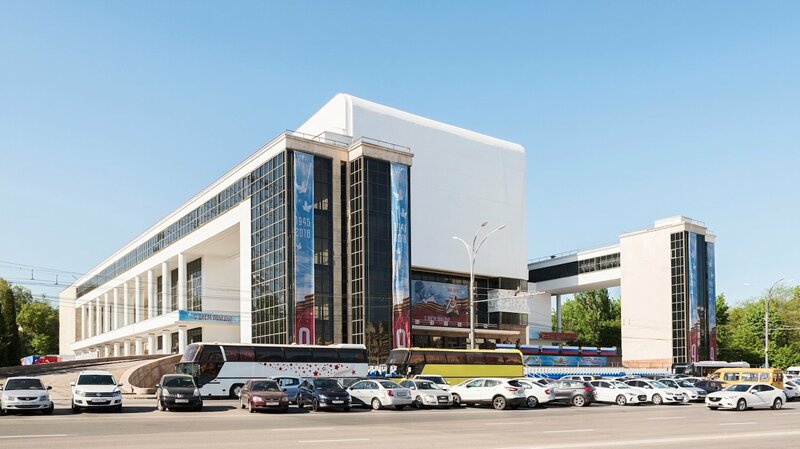 In four short years the workers of Rostov-on-Don have created one of the finest theatres in the country.” The building’s allusion to a tractor is a conscious embodiment of the industrial mood of the era. The form is evidently anthropogenic, but is subtle in its symbolism. 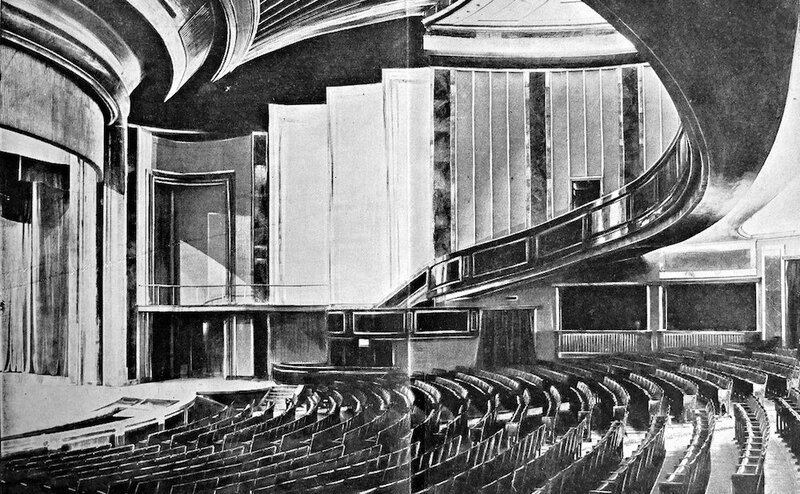 During the Second World War the theatre was partly destroyed. 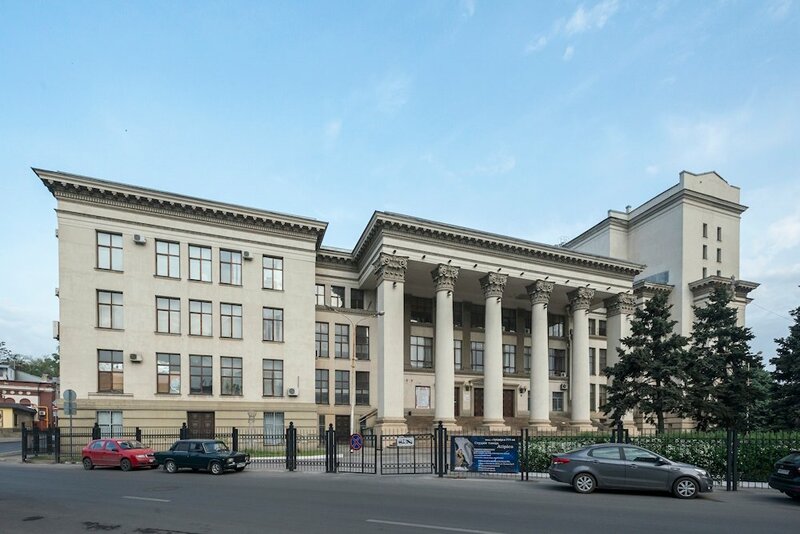 It is fortunate that the building was not restored in the post-war Stalinist period, as this would have invariably resulted in a neoclassical restoration. Instead, it was restored only in 1963, under Schuko’s direction. It was reduced in size but kept its original form and Constructivist aesthetic. Constructivist residential buildings appeared alongside the flagship projects of the first Five Year Plan. 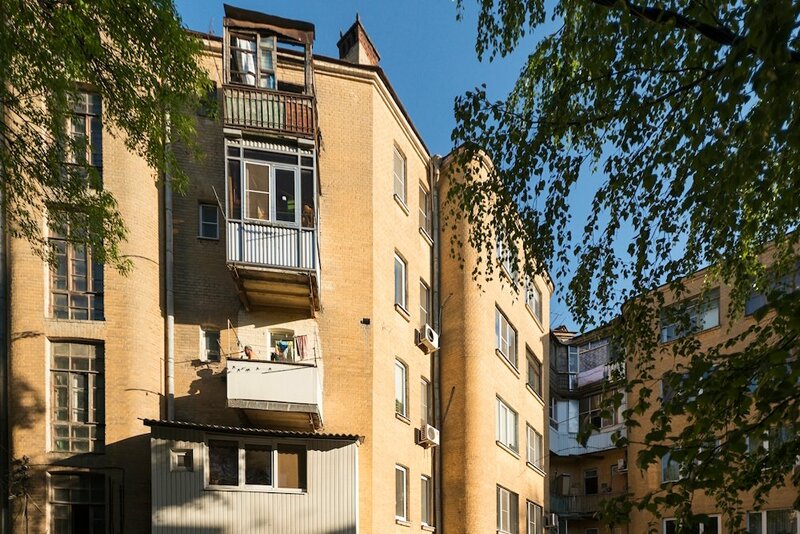 One such project, the residential complex of the construction cooperative New Way, was designed by the architect and civil engineer Mikhail Kondratiev in 1931. The residential complex, consisting of two huge buildings joined together around a wide courtyard, occupies an entire quarter in the historical centre of the city. The buildings, owing to their unusual zig-zag shape, are known colloquially as the “accordion houses”. The complex houses many facilities that make it into a kind of city within a city, including a gym, a laundromat, day-care facilities, a bathhouse and a meeting hall. Thus the design makes possible the kind of communal life that Constructivism sought to create. Rostov-on-Don was heavily bombed during the Second World War. Around 2,000 buildings, including a significant portion of the city’s Constructivist legacy, were reduced to rubble. Some of the buildings that were restored were redesigned according to the prevailing neoclassical style of the late Stalinist period. Such was the fate of the Lenin Palace of Labour. Conceived as a memorial to the leader of the revolution, the Palace was one of the first Constructivist buildings in Rostov-on-Don, and a highly typical example of the movement’s functionalism and aesthetic, with expressive and contrasting lines and a bold, soaring tower. The Central City Hospital, built according to a Constructivist design in the 1930s, was also changed almost beyond recognition during post-war restoration, with only one of the buildings retaining its original structure. While neither German bombs nor Stalinist neoclassicism can threaten Rostov-on-Don’s Constructivist legacy anymore, the transition to capitalism has been accompanied by the emergence of a new set of dangers. As in cities throughout Russia, many buildings in Rostov have had their lower floors mutilated by tasteless and vulgar signs, makeshift add-ons and air-conditioning exhausts. 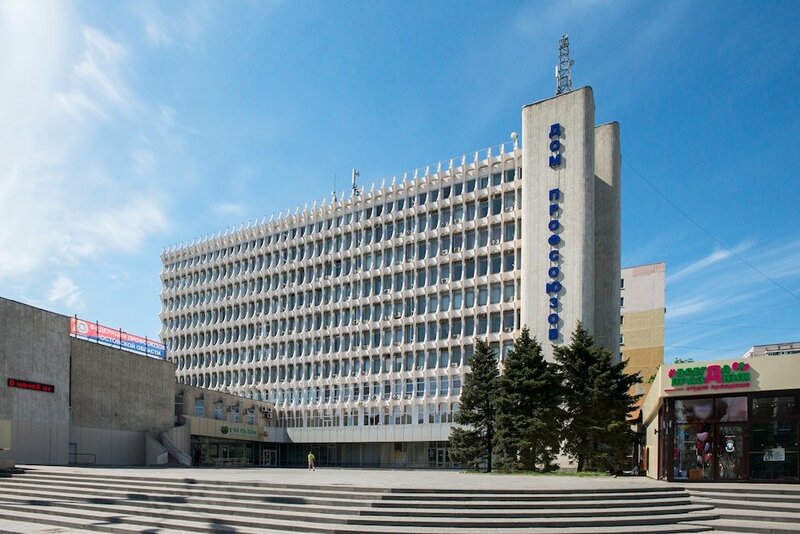 As the authorities have thus far failed to extend state protection to Rostov-on-Don’s Constructivist buildings (with a few rare exceptions), landlords are free to change the appearance of the buildings they own in any way they please. It is not just contemporary additions that are problematic — restoration can also be damaging. The original designs are rarely consulted, which leads, for example, to the plastering of façades which were originally designed to be of bare brick. One of the worst offenses concerns the Rostov-on-Don Port Workers’ Complex, which has had all of its original decorative elements removed and has been painted pink. Local architects have established committees and demanded that they be allowed to oversee the restoration work, but so far their efforts have been in vain. The restoration of the world-famous Gorky Drama Theatre which began years ago remains unfinished, and the building is currently obscured by scaffolding. 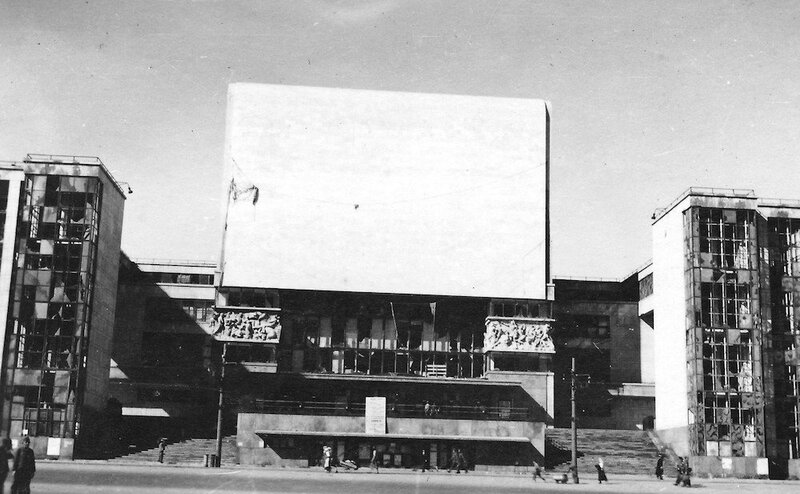 The regional Ministry of Culture has now demanded that the façade of the Gorky Drama Theatre be renovated by the beginning of May. There is, then, some cause for celebration: when football fans from around the world arrive this summer, Rostov’s greatest monument will at least allow them to see the city’s Constructivist legacy at its finest.